The following article and photo appeared in today’s Akron (OH) Beacon Journal. The Catalyst is a Grace Brethren church plant in the Kent, Ohio, area. This is an excerpt. Churches in need of space turn to local theaters. Salvation is being offered at two local theaters on Sunday mornings before the first screenings begin. Last Sunday, the people of Catalyst began meeting for 10:30 a.m. worship service at the Regal Cinemas, located at 5339 Darrow Road in Hudson. 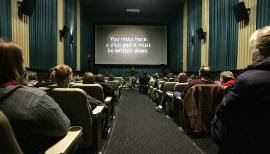 The move places the nondenominational Christian church in a group of about 300 congregations in the nation that currently use movie theaters for religious services. The growing trend was considered a novelty 25 years ago, when Granger Community Church in Indiana began worshipping in a movie theater, according to Barry Brown, director of worship solutions with National CineMedia Inc. The corporation, which oversees non-movie rentals in AMC, Cinemark, Regal and other cinema chains, formed its worship solutions division two years ago to help the growing number of churches looking to rent space in movie theaters.